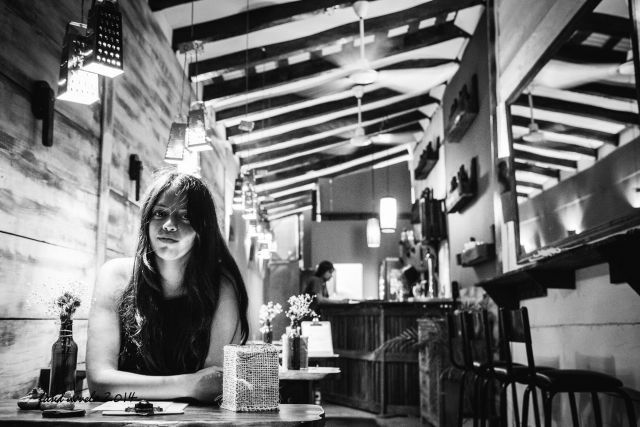 All over the world, a new generation of chefs has been experimenting with food and creating new dishes, except — until recently — in Puerto. Even now, most established restaurants have not changed their menus in years. But in the last 12 months, new restaurants have opened that may help make our town a culinary destination. 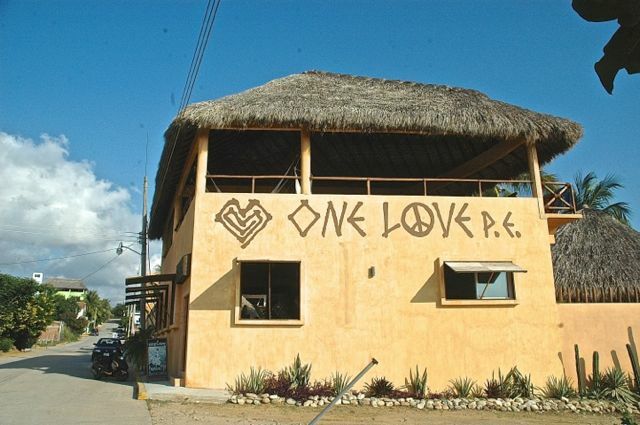 One Love, which opened in the Punta in April, already has a serious following. 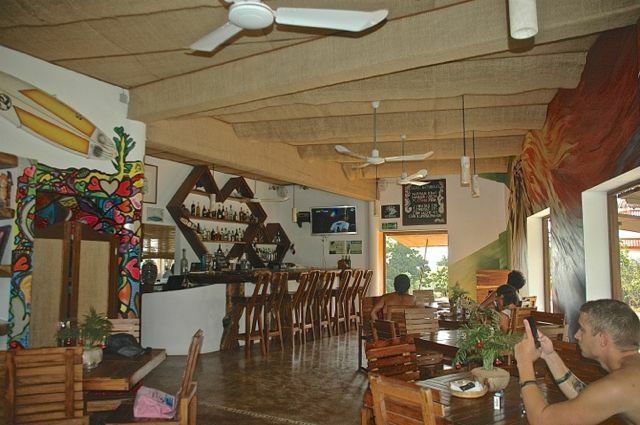 Large and airy with lots of windows and artwork, it is not like any other restaurant near the beach. The vibe is somewhat Brooklyn bistro or gastro pub. The customers are half international surfers from the adjoining hostel and half international residents from all over Puerto. The owners and wait staff speak Spanish, English and French. The food is simple, the ingredients are all fresh, but the plates are original. Who would have thought that putting cranberries on top of a thin crust pizza (shaped like a surf board) covered with the local cheese and crumbled blue cheese would taste so good? And it only costs 80 pesos! The menu features four main dishes ranging from 80 to 120 pesos: a vegetarian grilled egg plant, catch-of-the-day fish, breaded in pumpkin and sesame seeds, cheese stuffed chicken breast, and a grilled beef filet with chipotle goat cheese sauce. There are many starters and spaghetti dishes. And then there are the desserts… The wine list is extensive and soon may include imported Bordeaux. One Love is on calle Tamaulipas, down the street from the Hotel Esmeralda. Tel. 954 129-8582. Open 9:30 a.m. to 9:30 p.m. Bar open until 11 p.m. Closed Mondays. Quetzalcoatl Zurita Bustamante & Shalxaly Itzaguel Macías Rodríguez, Almoraduz. 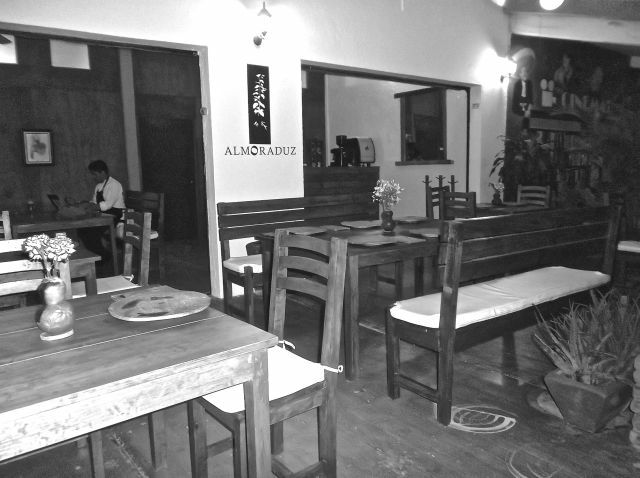 Almoraduz, on the other side of town, on the Rinconada, is the hottest spot for fine dining. 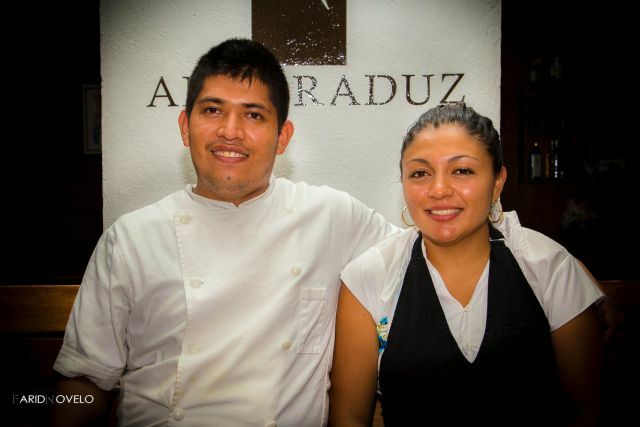 The signature cuisine of the husband- wife team of Quetzalcoatl Zurita Bustamante and Shalxaly Itzaguel Macías Rodríguez reflects their professional training (they met at the Instituto Culinario de México) and their Oaxacan roots. The menu at Almoraduz changes every three months, which is a good reason to keep coming back. Main dishes include fish-of-the-day marinated in achiote paste and served in a peanut and garlic crust with a grilled pineapple and green tomato sauce. 150 pesos. Or you might try the rack of lamb with flying ants (chicatanas), served with a pumpkin purée and cacahuazintle corn. 280 pesos. For dessert try the Oaxacan molten chocolate served with burned milk ice cream. As you might imagine, this is a slow food restaurant. Almoraduz is on the Rinconada next to Café Choc. Tel. 954 582-3109. Open 2 p.m. to 11 p.m. Closed Mondays. Meanwhile, chef José Miguel Araña continues to impress us at Cayuco on Zicatela beach. Now in its second year, but with a new menu, Cayuco also specializes in gourmet Oaxacan cuisine. The beef tongue is served in a in black chilhuacle sauce accompanied by plantain tostones and mushrooms and quintoniles (a pre-Hispanic spinach-like green) (160 pesos). Other specialties include chicken breast stuffed with hoja santa, shrimp and requesón (145 pesos) and sealed tuna with a sesame seed crust (125 pesos). Cayuco is on Zicatela opposite Cabañas Acali. Tel. 954 104- 2078. Open 1 p.m. to 10 p.m. Closed Mondays. Going back to bistros, La Lolaila on Zicatela next to Palma Negra, has fitted a narrow space with narrow tables and counter seating and (why hasn’t anyone done this before?) sky lights to create to create a Mediterranean atmosphere to go with its Mediterranean food. 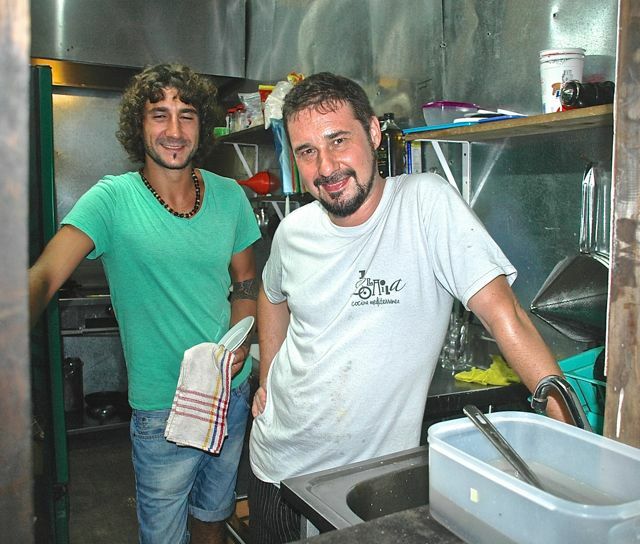 The three owners — the two chefs Pere Herrero, from Barcelona and Alejandro Villegas, from Seville, and Lorena Serrano Roda of Madrid — met while working in restaurants in Ibiza, and they bring a lot of experience and enthusiasm with them. The restaurant opened in September, and the menu is still a work in progress. They gave up trying to make paella because they couldn’t find the right kind of rice. The chicken croquettes and the chicken breasts stuffed with plums, however, are a pure delight. There is also fresh fish and humus. La Lolaila is on calle del Morro, Zicatela. Tel. 954 582-2950. Open 8 a.m. to noon, 3 p.m. to 12 a.m. Closed Mondays. Palma Negra the ice cream parlor and creperie that opened last spring is already a Zicatela landmark. The owners, brothers Enrique and Alejandro Amezcua Hernández from Michoacán, have created what could be called an ice cream lab as they are always experimenting with new flavors based on fruits from the market, Nutella, and Oaxacan chocolate. Frusalada / Raw Café opened on Zicatela beach in November as an addition to Restaurante-Beach Club Acuario. The frusaladas are fresh fruit sorbets. The raw foods are mainly original salads and cheese dishes. The menu also includes sushi, grilled fish and traditional Mexican food. In fact, something for everyone. Finally, back on the Rinconada, Luna Rossa, next to Cafecito, has a new owner, chef Bruno Agliatti, a native of the Piedmont region of Italy, who is arguably serving the best pizza and pasta dishes in town.